Beyond the blinking lights and jingly-jangly sounds of the gaming floor, the tables inside Three Peaks Kitchen + Bar are packed with diners on a recent Friday night. Waitstaff hustle back and forth with steaming bowls of chili, towering burgers and foam-topped pints of beer. My guest and I wind around tables back to the bar to get further away from the activity of the gaming floor. There, the bartender tells us there are casino games on one side if we'd like. We're here for the food, though, so we slide up to the sleek, ultra-wide bar made of sparkly black granite. Basketball is playing on the TVs above the plentifully stocked shelves, and from here we can see cooks bustling in the massive kitchen. 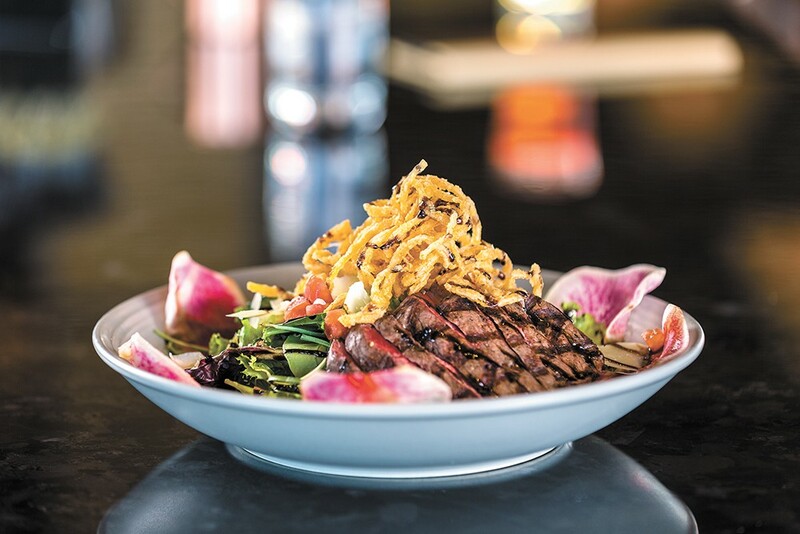 Three Peaks is the dining centerpiece of the new Spokane Tribe Casino that opened early this year on the far western edge of Airway Heights. (For those who've not yet made the trek, you'll know you've nearly arrived when you hit a new roundabout at Highway 2 just past Craig Road.) The restaurant is named after three prominent peaks in the Inland Northwest — Mount Spokane, Cayuse Mountain and Steptoe Butte — that roughly outline the Spokane Tribe's ancestral homelands stretching across 3 million acres. Chef Blerita Kaba crafted a comfort food-focused menu for Three Peaks, drawing from her diverse culinary background. Though it's technically located inside the casino, just to the left inside the main entrance, Three Peaks is family friendly and serves a children's menu. 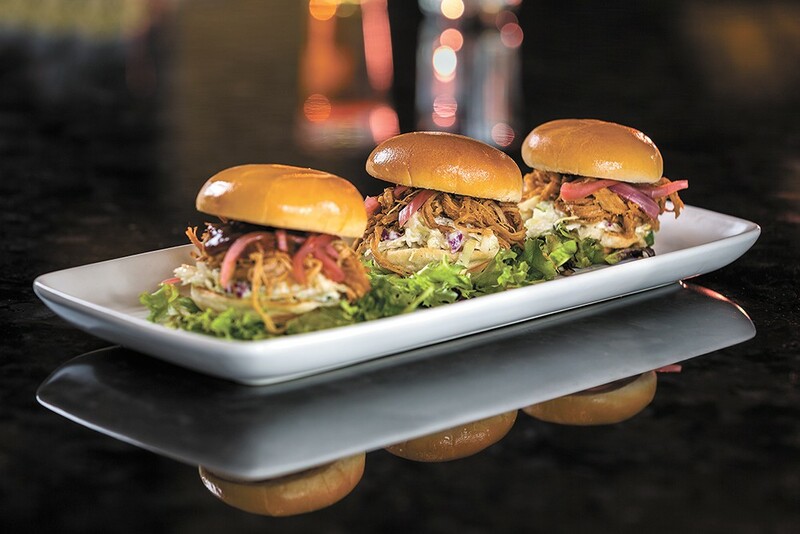 The daily menu's overall theme is classic American, with scratch-made items highlighting local ingredients whenever possible. Chef Blerita Kaba heads the kitchen and says her intent for the menu is to focus on high-quality, fresh comfort food. "Honestly, I just took a lot from living in different states... and a lot of flavors from different cuisines," she says. "If you look at our menu now, it's very broad — you can find tacos to an Italian dish to wild salmon to American classics, so it's a little bit of everything for everyone, but I put my spin on it." Kaba, who was born in Albania, started working in her family's restaurants at age 12, working her way up through the ranks since. 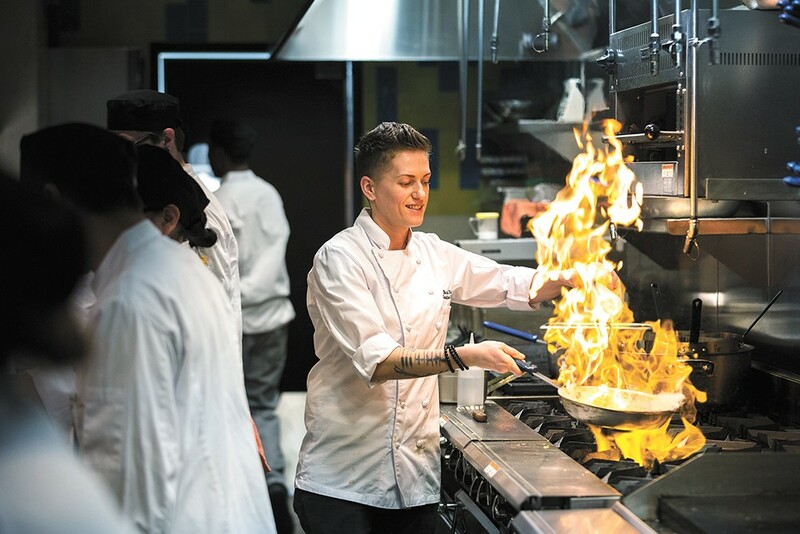 She's been at Italian spots in New York City and opened her own Italian eatery in Arizona. Before coming to Spokane in 2015, she ran a hotel restaurant in Alaska. Here, she's worked for Twigs Bistro & Martini Bar and was the opening chef for the local chain's Tortilla Union eatery at River Park Square. Out of all the options on the menu, Kaba's favorite is the ribeye ($33) served with fried leeks, a garlic mash and seasonal vegetables. Another house favorite is the bison chili ($5 cup, $9 bowl). Other items on Three Peaks' "Signature Plates" menu include the pan-seared wild salmon with herbed dill sauce and saffron rice ($19), along with chicken fried steak, fish and chips, a taco platter and a seafood platter. Sandwiches include several burgers, a French dip ($12), Reuben ($12) and the signature bison burger ($17.45). Sandwiches are served with choice of fries, tater tots, green-bean fries or, for a $1 upcharge, a side salad or soup. Chef Kaba also creates daily specials (served from 11 am-3 pm), which aren't far from what's served on the regular menu, and again speak to the restaurant's comfort-food focus with dishes like lasagna, meatloaf, chicken parmesan, tuna casserole and beef stroganoff. "I do think we have something for everyone — that is what sets us apart," says casino marketing manager Joni Hay-Smith. "It's really nice when you're dining with a large group and you can go and everyone can get a dish they're happy about." In the bar, customers will find a standard lineup of domestics in bottles and on draft, along with craft beers from local and regional breweries like River City, Iron Goat, Orlison, 12 String and No-Li. Next to each item on the food menu, Three Peaks suggests a beer pairing. There's also a "50 Wines under $50" list, which breaks down the restaurant's wine list by price, starting with the $5 "blind wine" option: "you pick the color, we pick the juice." Signature craft cocktails ($8 each) include a smoked old fashioned, Moscow mule, cucumber gimlet and the "tiny tinis" martini sampler. Happy hour runs Monday through Friday, from 3-7 pm and offers $3 pints, wells and house wines, along with select appetizers at $3, $4 and $5 each. The original print version of this article was headlined "Peak Treats"